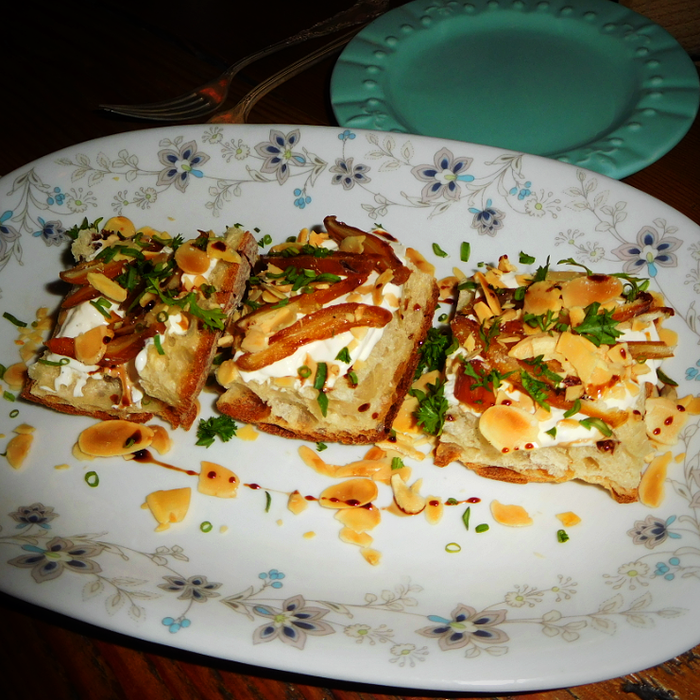 We had dinner for the first time at Tillie’s this past Thursday. I’ve posted a review on my blog. 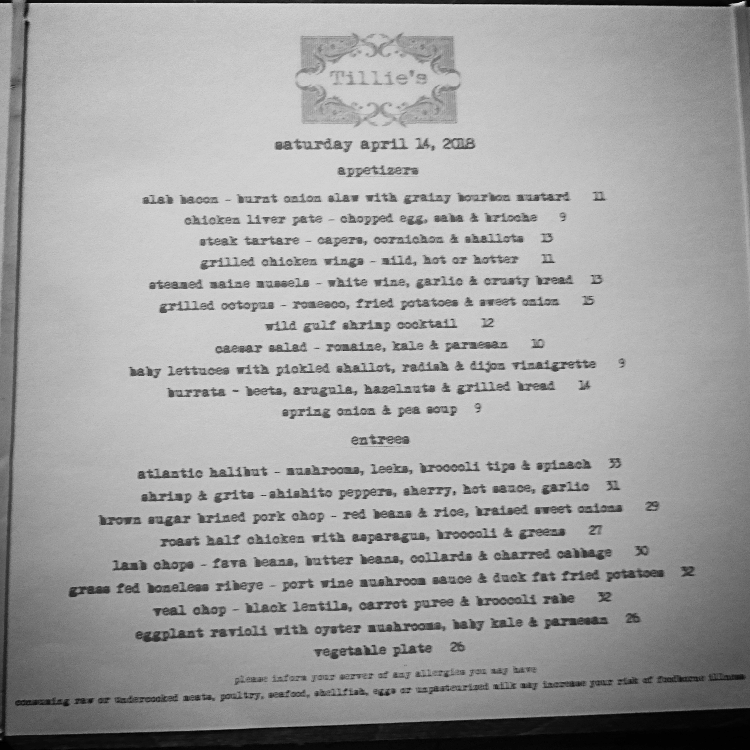 We had another excellent dinner at Tillie’s on Saturday night. We go here once a month, and Chef Wirt is always very generous to us by comping us something that is not on the menu. 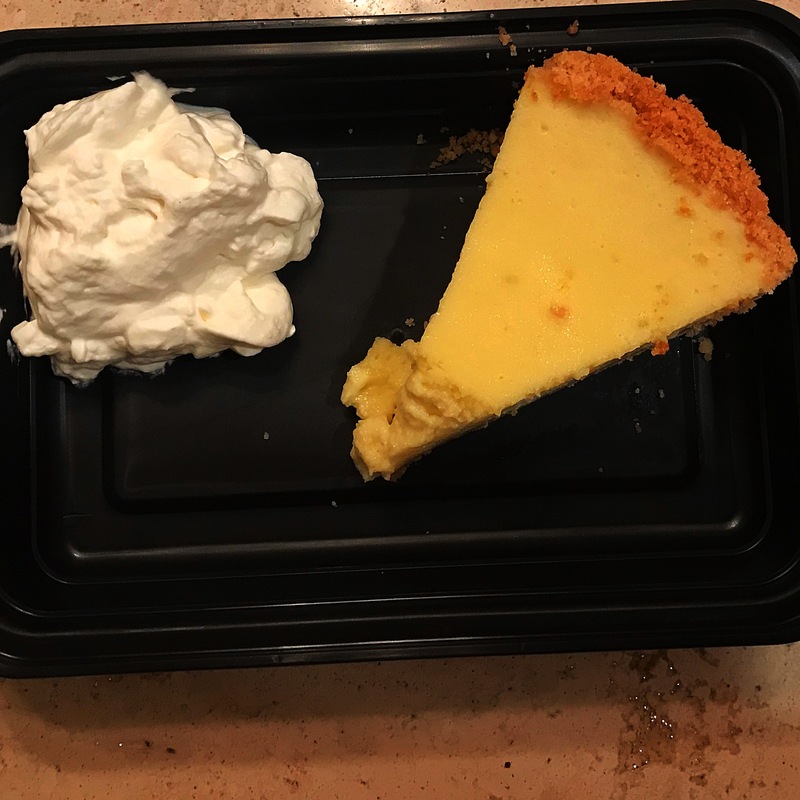 In turn, I always try and bring a bottle of wine for the Chef to share with his wife Karen, who is also the excellent pastry chef, that probably makes the best key lime pie North of Key West. Last night I brought Chef Wirt an excellent bottle of Red Zinfandel which we also had with our dinner last night. 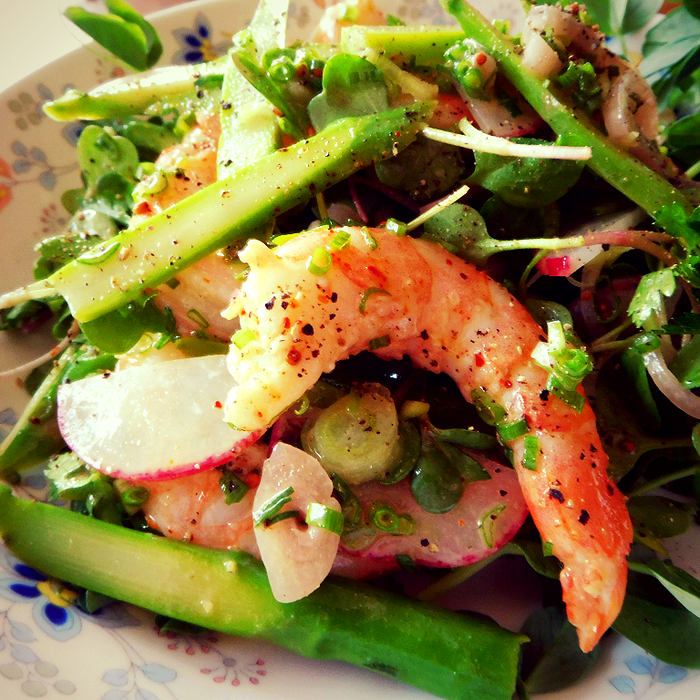 The comped dish of the day was a very refreshing salad of perfectly cooked shrimp, asparagus, radishes, and very flavorful pea greens in a light vinaigrette. Chef Wirt needs to add this to the Spring menu. 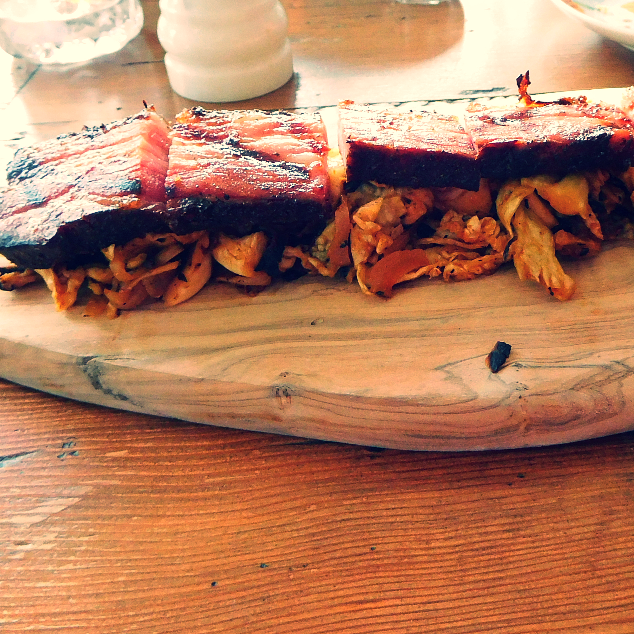 We also had the amazing smoky slab of bacon with burnt onion slaw, and grainy bourbon mustard. All of the flavors went so well together. This is one of my favorite bacon presentations. 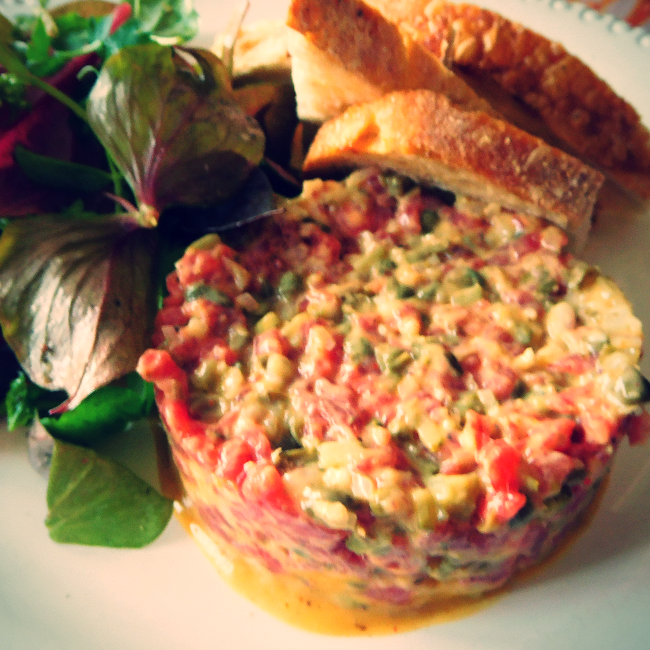 Our other appetizer was the Steak tartare with capers, cornichons, shallots, in a grainy mustard, with toasted rye points, and some amazingly fresh minor greens and herbs that tasted like they were just pulled from the soil. Most Chefs would just throw on some boring flavorless greens on a plate, but Chef Wirt’s greens and vegetables are always farm fresh, and you can taste the difference. 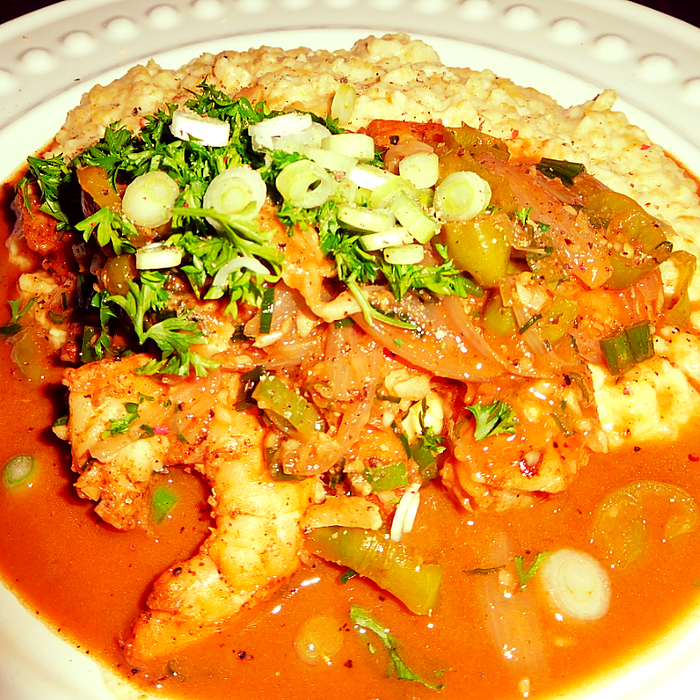 For entrees Mrs. P had her ‘death bed’ meal of spicy shrimp & grits, with shishito peppers, sherry, hot sauce, & garlic. 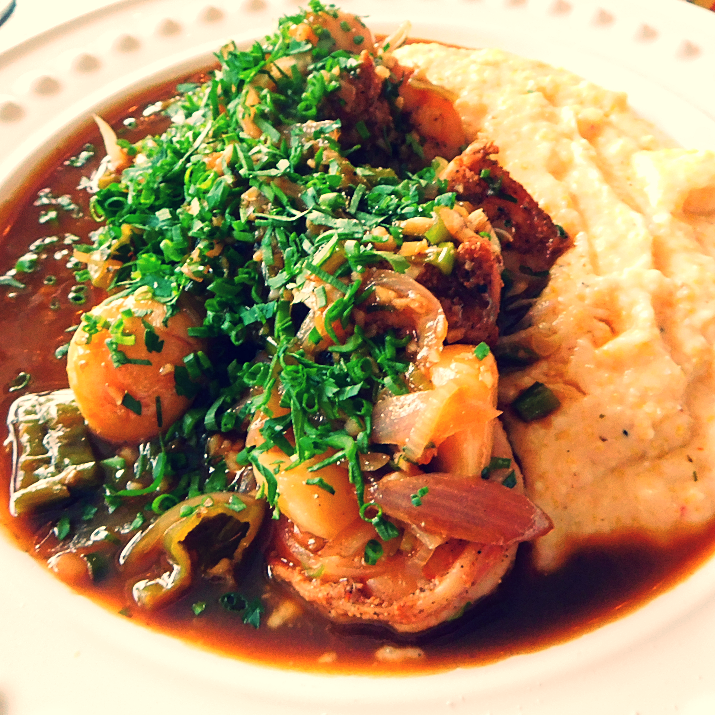 This is not your normal preparation of shrimp & grits, which is usually in a white butter sauce. Mrs. P is from New Orleans, so this is right up her alley. 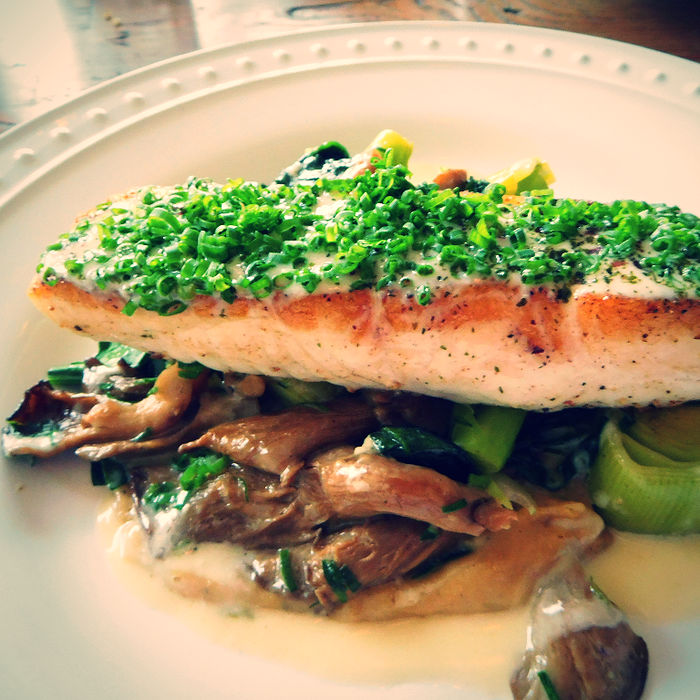 Since I had so much meat for appetizers, I decided to try the excellent Atlantic Halibut with mushrooms, leeks, broccoli tips, and spinach, in a white beurre blanc that really complemented it. The vegetables were cooked to perfection. 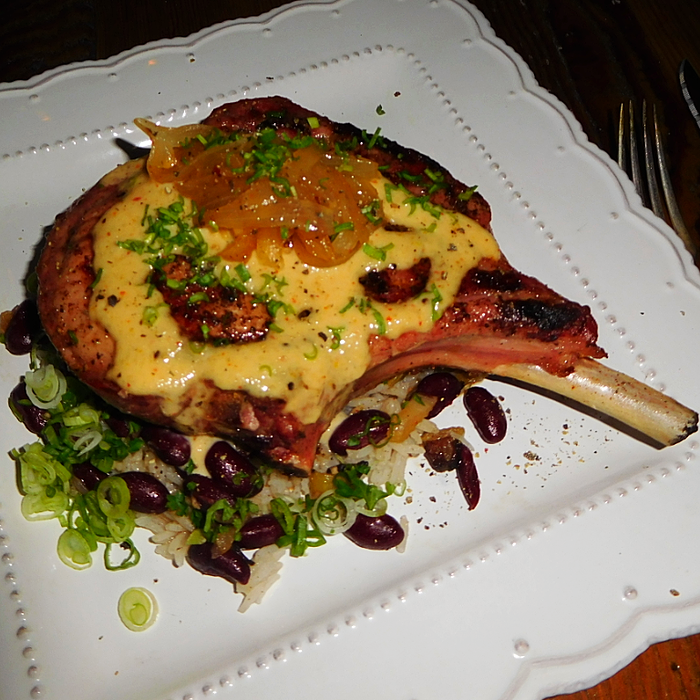 I normally get the excellent pork chop, but this hit the spot. Below is the current menu, which changes fairly often, depending on what is fresh in the market and farms. Excellent review, Eli! 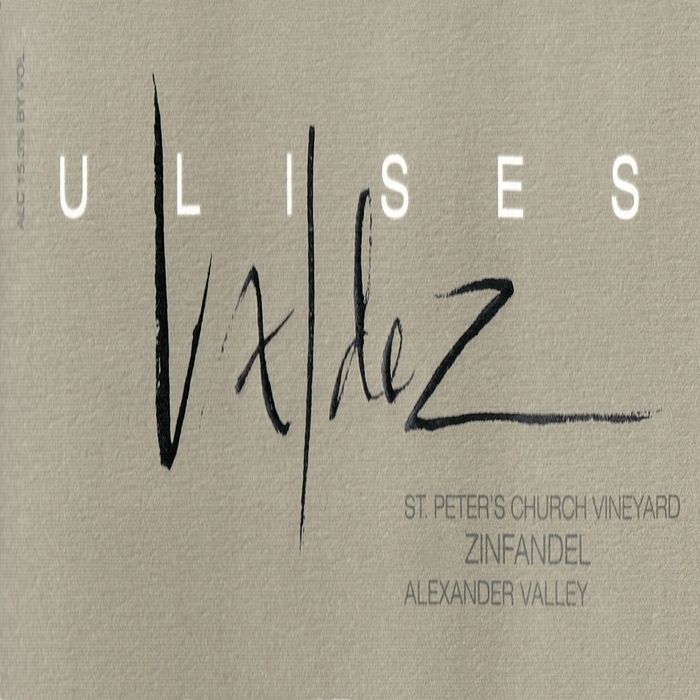 And thanks for posting the current menu since the website has only a “sample” menu. Lamb chops! Definitely need to make that return visit to Tillie’s while he’s still serving them. Looks amazing. Nice to see a place treat vegetables and geeens well both in flavor profile and preparation. So many places mail it in to focus on the protein and just slap on something that is usually overcooked mush. Thanks Mr. Met. Yes, Chef Wirt definitely treats his vegetables with respect. We had another spectacular dinner at Tillie’s Sunday night. 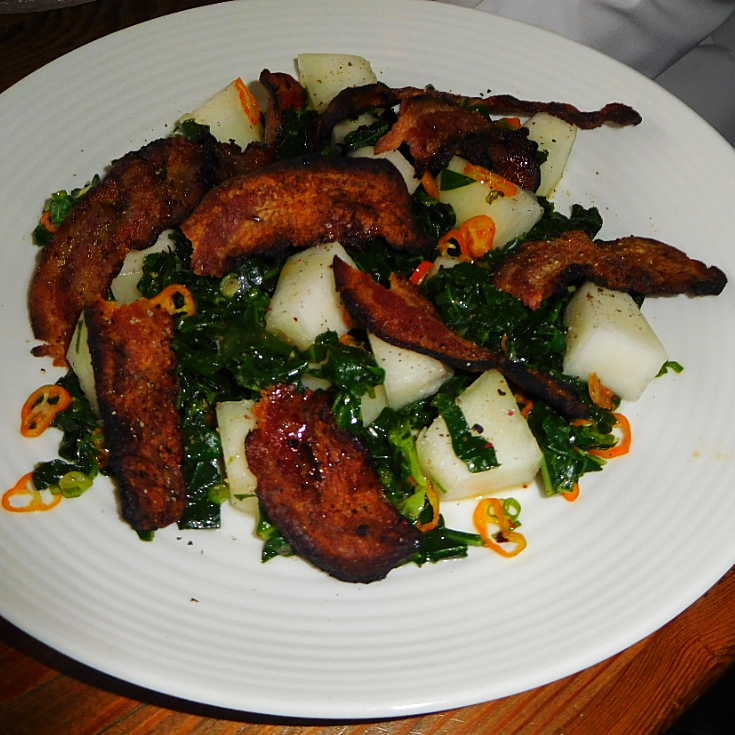 The outstanding comp of the day was smoked crispy pork jowls, with honeydew, shishito peppers and pickled collard greens. It tasted just like bacon and the smokiness was a great contrast to the sweet honeydew. I gave Chef Wirt a nice bottle of Cotes Du Rhone in appreciation of all the comps he always gives us. 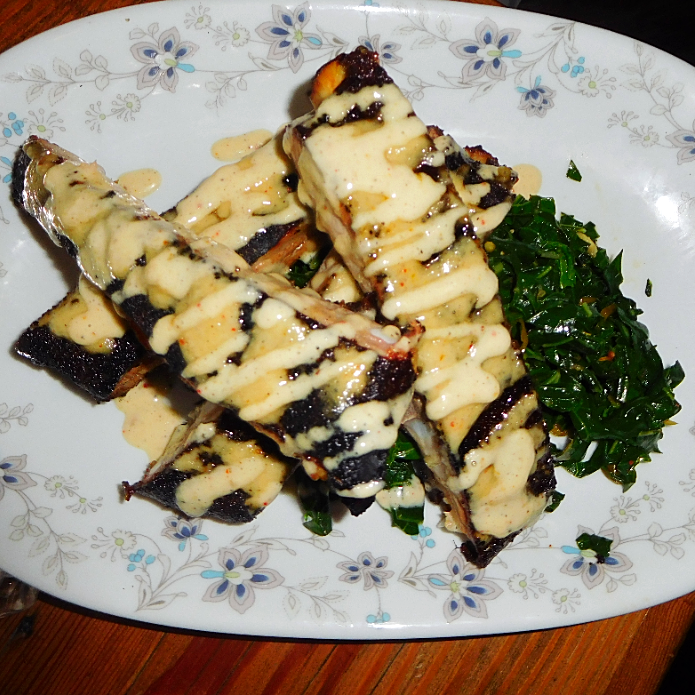 We also had excellent smoked spare ribs with white BBQ sauce, pickled collard greens with chili vinegar. 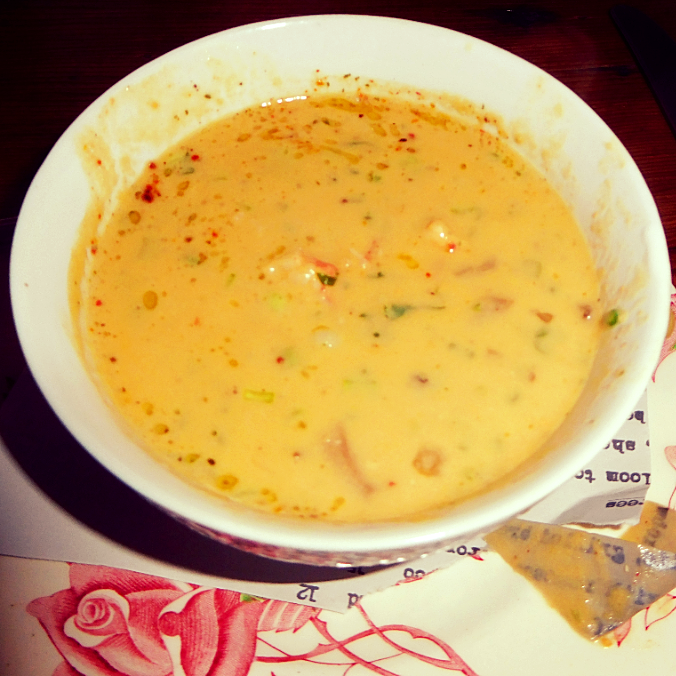 Another fantastic appetizer was sweet corn soup with Maine Lobster and maitake mushrooms. Below is a split portion. 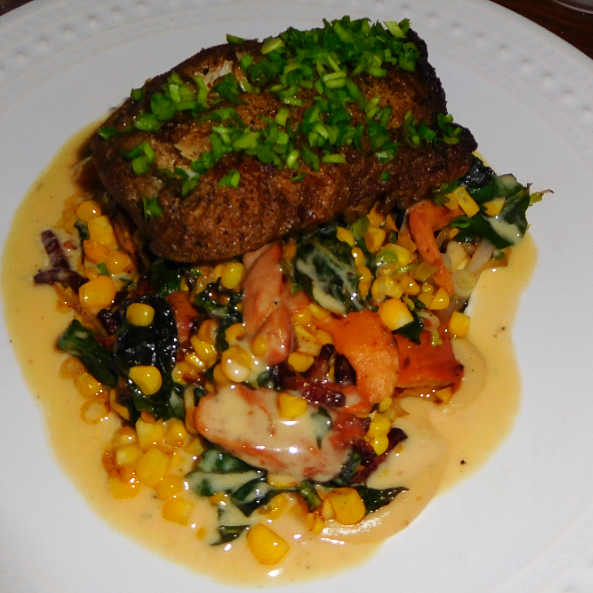 For an entree I had crispy pan roasted cod with wild mushrooms, sweet corn,bacon, swiss chard, and collard greens. Those ribs look really interesting! I don’t think Chef Wirt knows Drew, but they do have similar styles with meat. Wirt uses more vegetables though. He has his own smoker, and smokes his own meats. 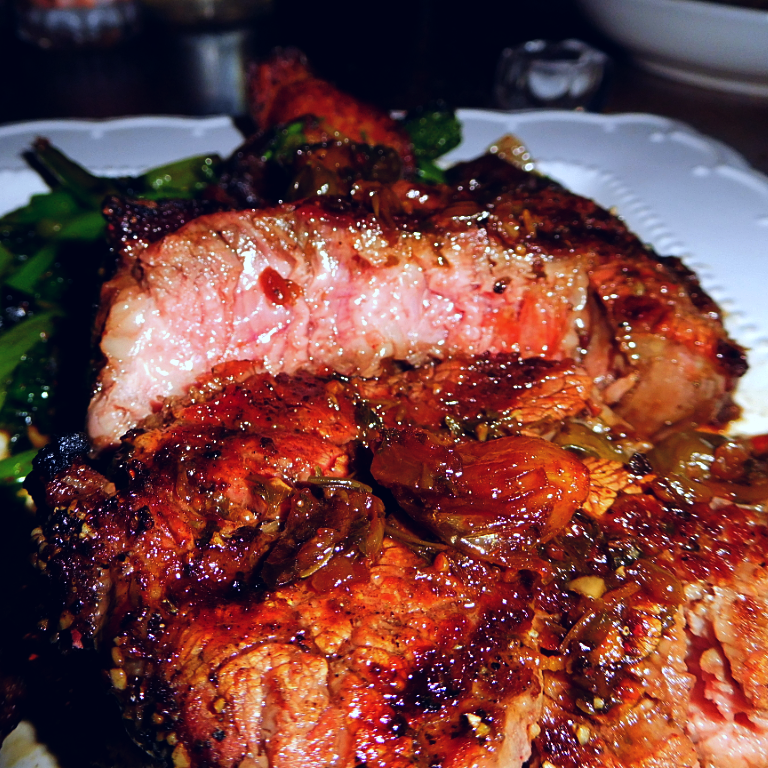 The ribs and pork jowls had a nice smoky flavor. The white BBQ sauce was a nice change on the ribs (instead of the usual red BBQ sauce). It was some sort of aioli sauce. Tonight Mrs. made a variation of her sausage and pepper dish. This time she used Aidells excellent spicy mango with jalapeno smoked chicken sausage, with long hot peppers, home grown jalapeno and holy mole peppers, red onions, fresh figs, red onions, and EVOO. The sweet figs were a nice contrast to the smoky sausage and spicy peppers. I didn’t take a picture because I already recently posted about a sausage and peppers dish that Mrs. P made with Italian hot sausages. That’s a nice sounding dish! Sadly , I haven’t had much luck with any sausage that isn’t pork. I don’t know. It is just a thing for me. I just have not enjoyed many variations with other species. However, Mrs P looks like she can turn water into wine! Thanks cj! 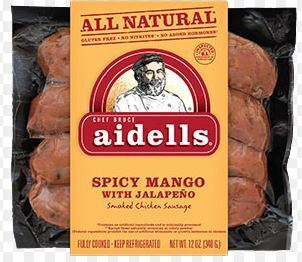 I normally don’t like chicken sausage either, but this Adells brand is very good. We got it at Fairway. You can probably get it online. It has a nice smokiness to it. Oh. That’s good to know. I have to see if our Costco sells them. Aidells has a lot of unusual flavors and the chicken sausages are a lot less fattening. We had another fantastic dinner at Tillie’s Saturday night. 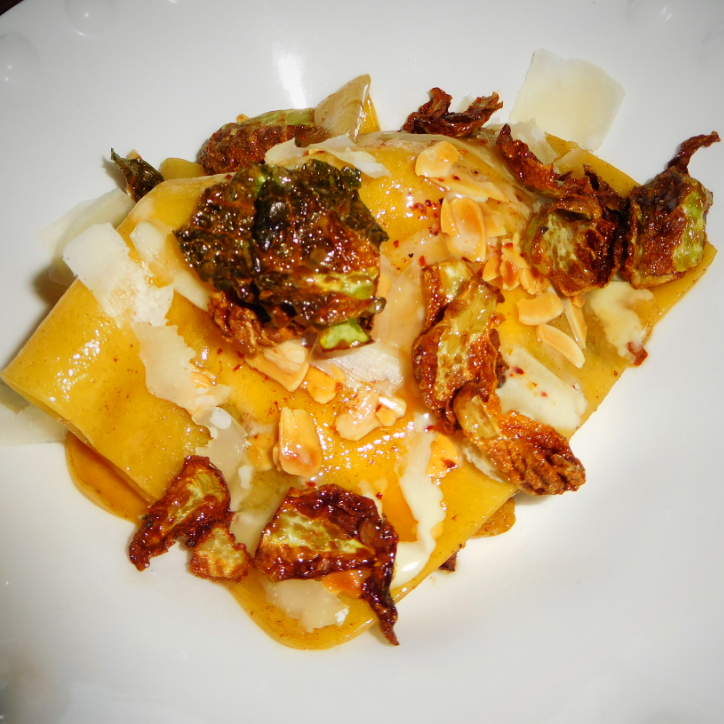 The spectacular comped dish of the night was a layer of pasta topped with fried Brussel sprouts, and covering a creamy poached egg, ham, toasted almonds, and shaved cheese. This was like gourmet comfort food and would make the perfect brunch dish. 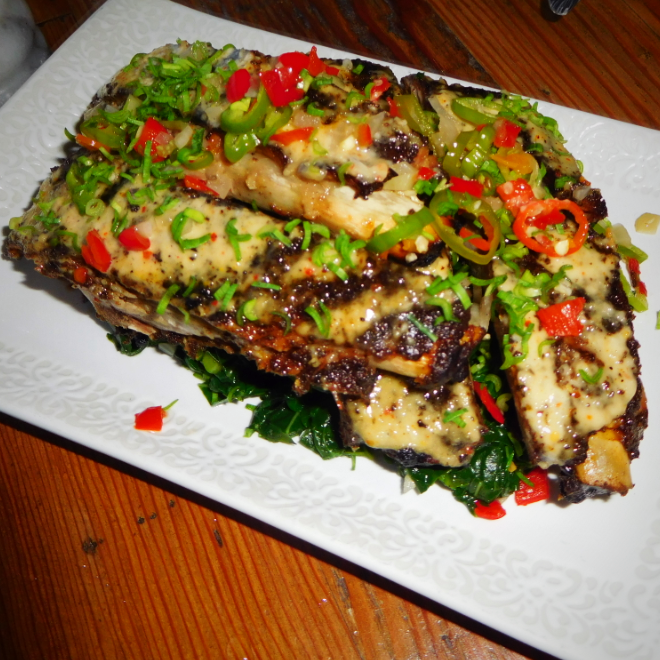 We also shared the awesome smoked spare ribs with white BBQ sauce, and chilled collards with chiles, as well as a great ricotta and fig crostini with toasted almonds and saba. 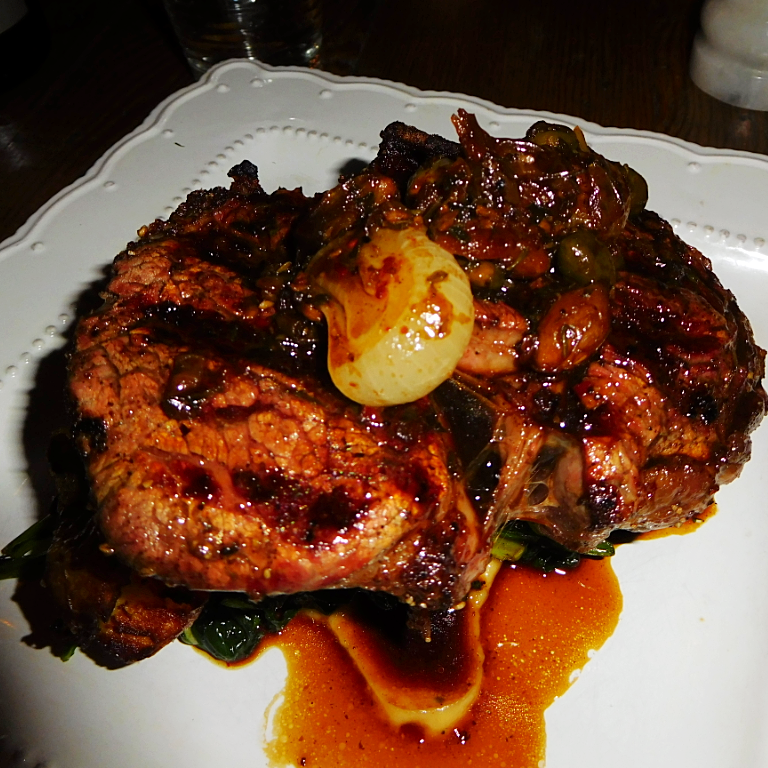 For entrees I had the excellent molasses brined pork chop with braised onions, and red beans and rice. Mrs. P had her usual shrimp & grits. Another excellent dinner at Tillie’s Saturday night. 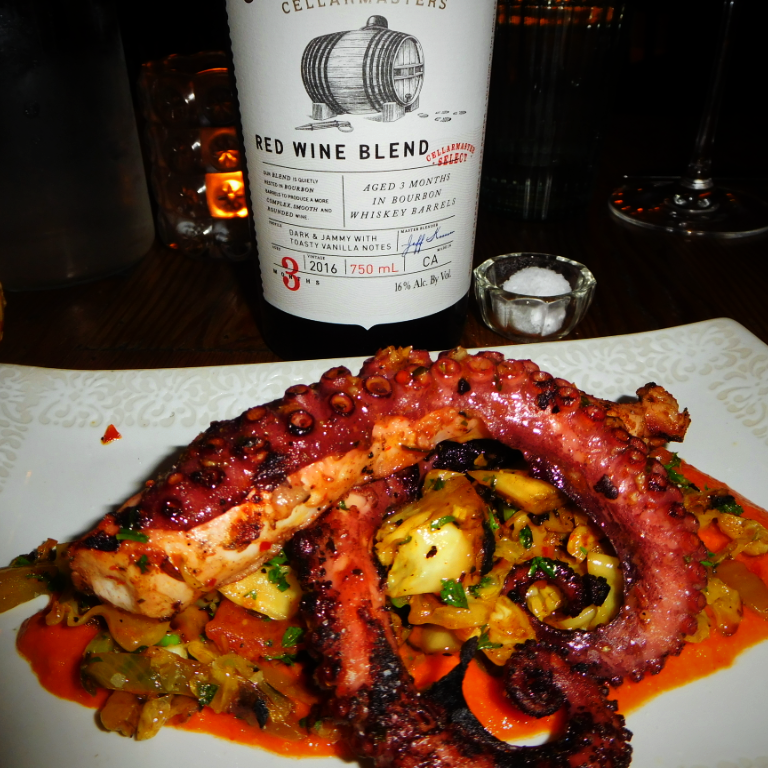 Grilled octopus with spicy cabbage and mustard greens, caraway, and romesco. 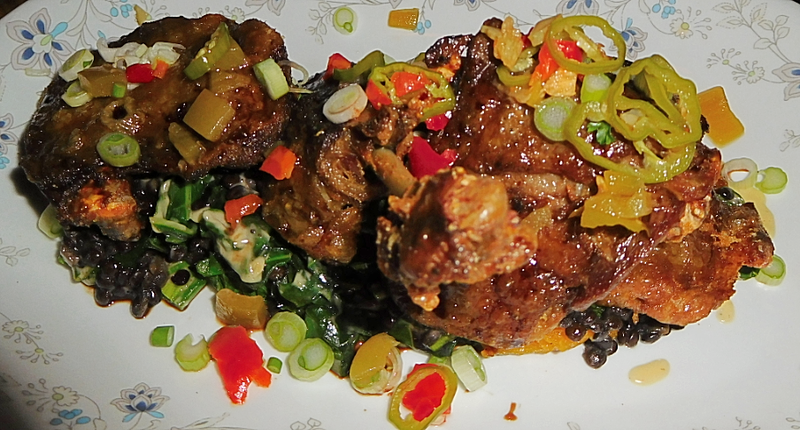 The outstanding comped dish of the night was crispy duck confit with collard greens, lentils, jalapeno, scallions, and sweet potato puree. 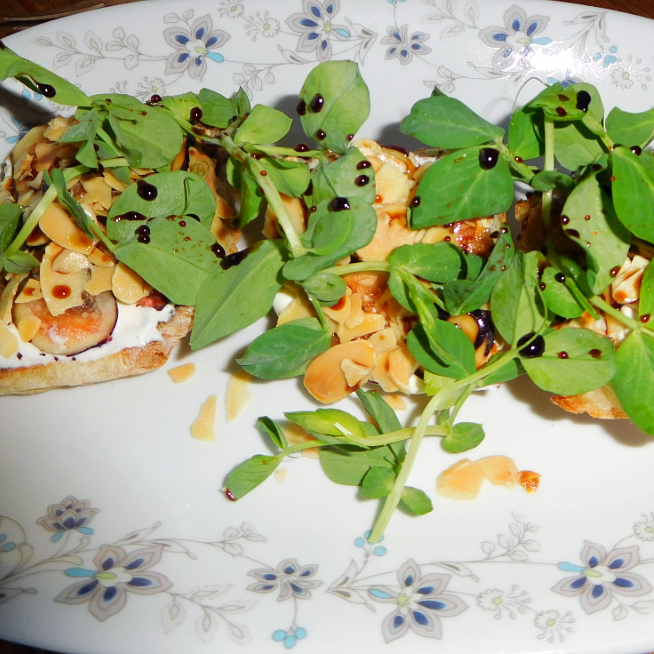 We also shared a great appetizer of ricotta and date crostini with toasted almonds and saba. For entrees we both had the always excellent spicy shrimp and grits with brandy, hot sauce, shallots, and shishito peppers. We drank Cooper and Thief red wine blend that was aged in bourbon barrels for 3 months. It went very well with everything. For dessert we took home the outstanding homemade key lime pie. 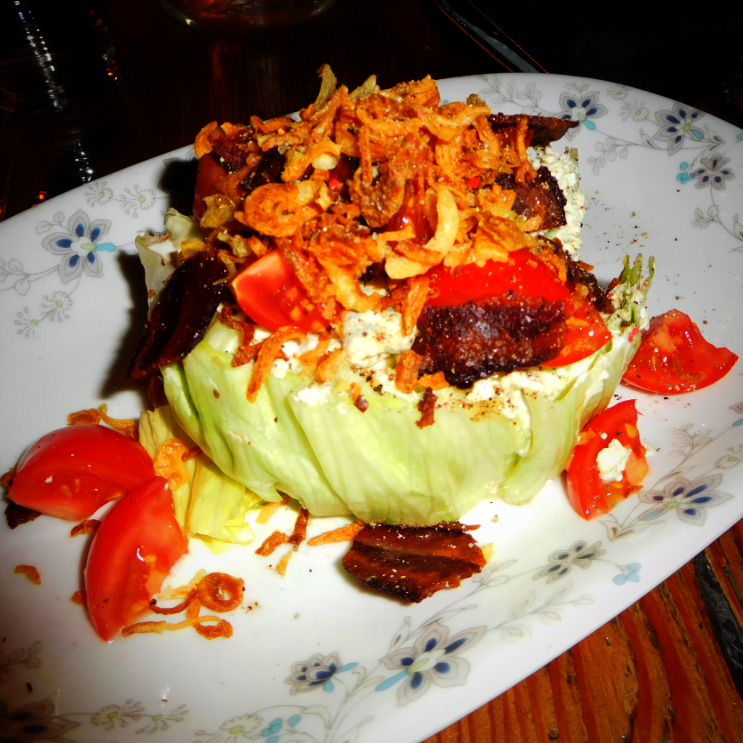 We had another fabulous dinner at Tillie’s Saturday night. 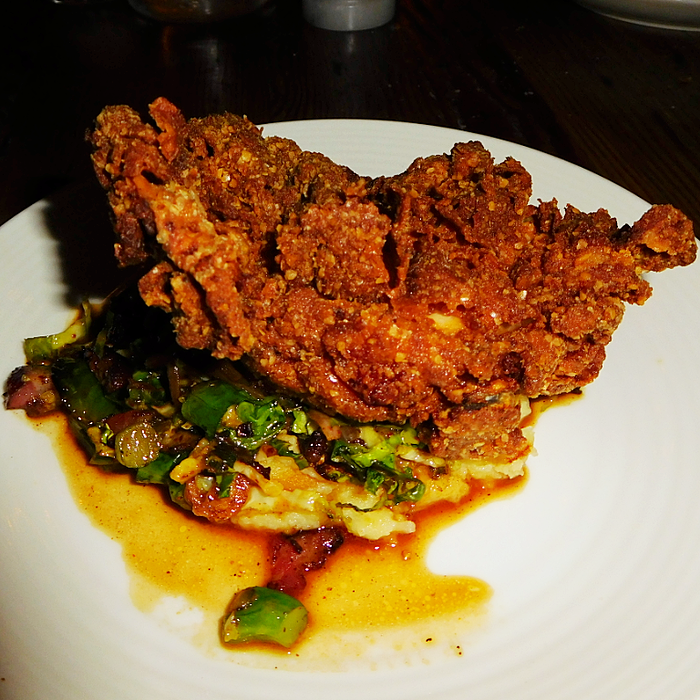 The outstanding comp of the night was a very crunchy fried chicken with mashed potatoes that contained broccoli tips, brussel sprouts, bacon, and onion gravy. 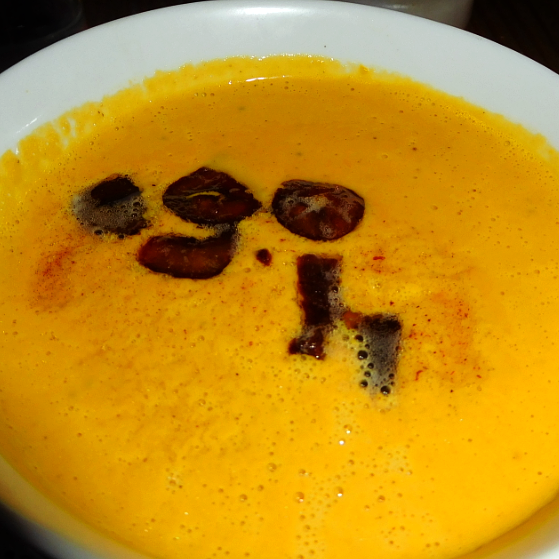 We also shared a roasted butternut squash soup with crispy chestnuts, and an iceberg wedge with blue cheese, tomato, crispy jowl bacon, and fried shallots. Below are both split portions (as well as the fried chicken above). For an entree I had a very flavorful grassfed ribeye with charred broccoli rabe, baby onions, and crispy duck fat potatoes. Mrs. P had her usual shrimp and grits. 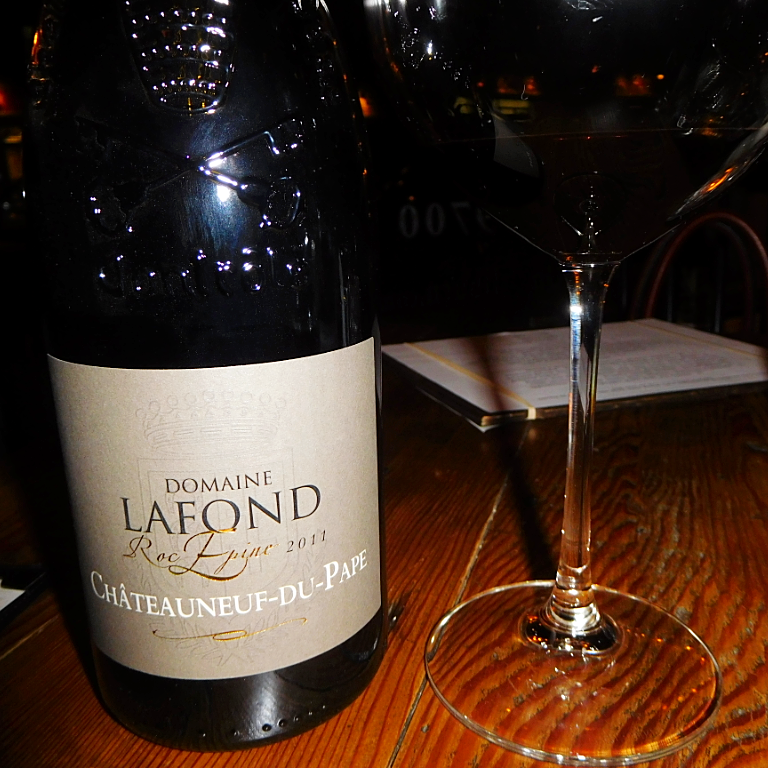 Everything went great with Domaine Lafond Chateauneuf Du Pape. We gifted Chef Wirt and his wife Karen a bottle of the Cooper and Thief red blend that was aged in bourbon barrels for 3 months. 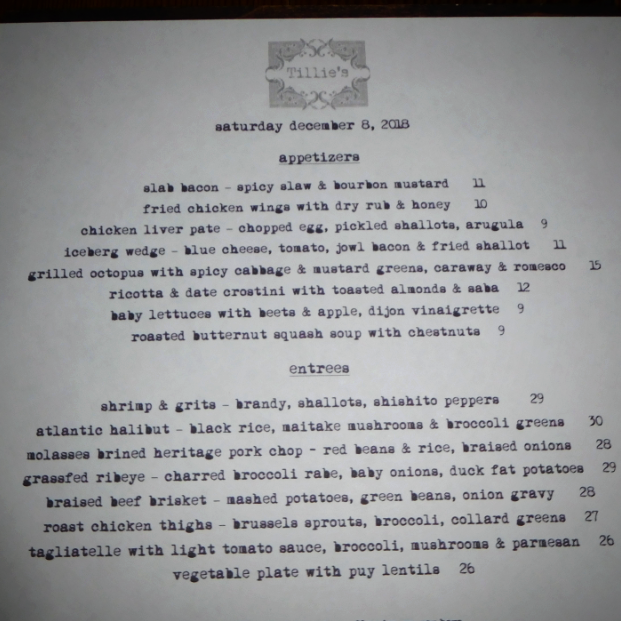 Below is the current menu.